From last Thursday afternoon to Monday afternoon, I was pretty much totally "unplugged" while three of us had our annual mini quilting retreat at friend Dotty's cabin just outside Yosemite. No internet service, or AT&T phone service either. It's amazing how much you can accomplish when you are not constantly checking Instagram. This is our 16th annual! We are always happy when we are finished with unpacking the car and setting up our sewing machines. It's quite a walk up and down this little trail, and I can never quite capture in a photo just how steep the angle seems to be. See the car up there? By the time we trekked back and forth with sewing gear, fabric, and, of course, food, we spent most of the rest of the afternoon and evening just visiting. Over the years, we have decided just to have two meals--breakfast and dinner. And at midday we just have a very light "snack." This never qualifies as an actual meal as there is no cooking involved. That makes sense, right? There may also have been some fruit and chocolate involved as well. Awhile back, I had purchased some wooden blocks for the grandkids to play with, Pattern Play. Cards are included and you can make 40 different patterns with the colorful blocks. Of course, all I could see was a fabric version. And then I received these two bundles of fabulous fabric from Windham Fabrics, Heavy Metal and Artisan Cotton. With only the cards as a guide, I started making blocks. The top left block is kind of a rogue block--there are lots of cards with mitered corners and it took awhile to figure out how to construct them--this block is not one of the cards but I'm keeping it in the quilt anyway as it is a really fun block. I ended up with 27 out of the possible 40 different versions, and I'll continue to work on making the entire set. While I brought other projects to work on, I was on a roll and just kept working on these blocks for the whole weekend. So I had nothing to hang over the railing, as is our tradition. We did venture outside one of the afternoons for a short walk. I had never noticed this sign before. I'm curious about the speed limit of "fast dust...."
Of course, life goes on while you're away. We heard that the royal baby had been born and we each guessed on what the new princess's name would be. We each seemed to get hung up on the fact that "Pippa" should be included. I was particularly thrilled when we learned that her name was Charlotte, as that is our granddaughter's name. Obviously a very good choice and I'm sure she is thrilled that a princess has been named after her. :) Our son, Aaron, and Charlotte had been on the way to the Bay Area over the weekend and they stopped at a Starbucks. 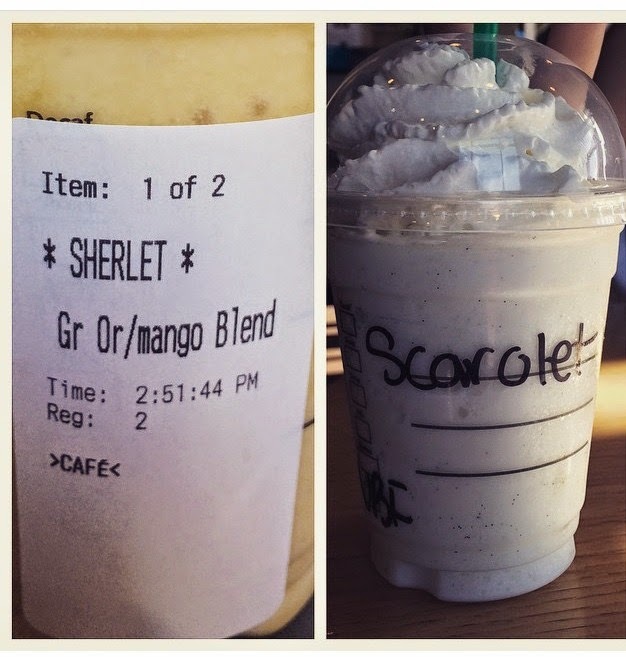 So the Starbucks baristas in Los Banos, CA, don't really have a clue how to spell the name "Charlotte." If there is any chance of Kate and William stopping there on a future royal visit, they probably should learn how to spell it properly. I also missed the Angel Babies fundraiser walk, which is held each May. Angel Babies is an organization which benefits families who have lost a child. Aaron and Christa always get a group together to honor Caleb, their first child and our first grandchild, who passed away at age of three days. He would have been 10 in March. 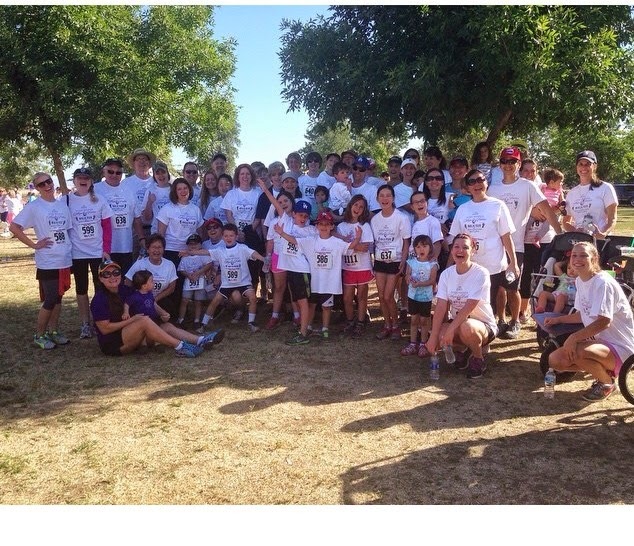 This year the team was the largest ever--approximately 60 people walking in his memory! I was so sorry to miss it this year. The Angel Babies motto is "We walk for the steps they never took." "There is no footprint so small that it does not leave an imprint on this world." I'm joining Lori Holt's (Bee in My Bonnet) Farm Girl Vintage quilt-along. I decided it was time to actually sew with my hoarded Anna Maria Horner fabric. So I decided to name my quilt "Anna Maria Moves to the Farm," and am using that as the Instagram hashtag. Look at the first comment after I posted the first block! It's not too late to leave a comment and get a chance to win a copy of Quiltmaker's 100 Blocks. A winner will be chosen on Saturday. My cousin, Cathy, and her husband, Terry, grow berries. It is berry season! 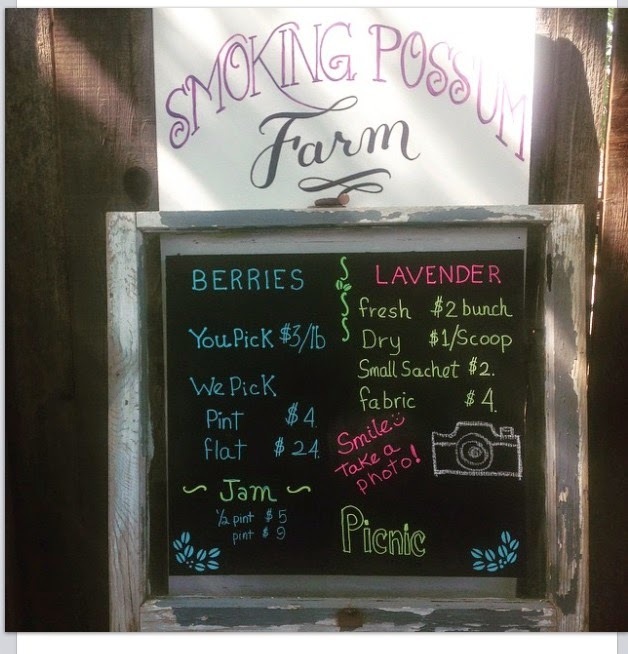 I should really give the background on their business name, Smoking Possum. It's a good one. This is my favorite picture of the week: baseball bats--one in every color. 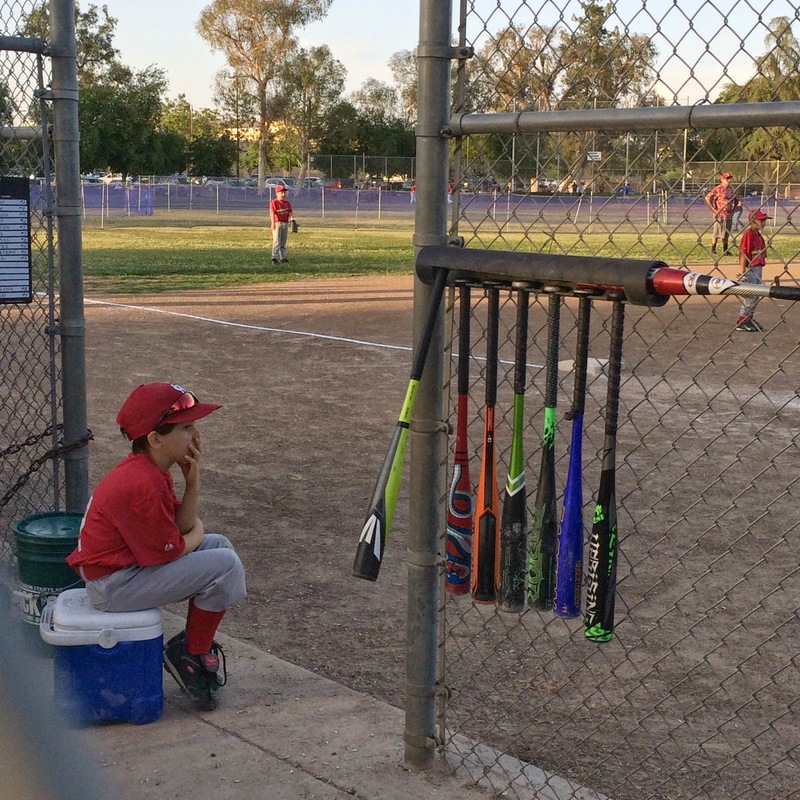 Oh, and a pretty cute picture of our baseball-playing grandson, Levi, concentrating on the game. Come back tomorrow for a Friday Finish--lots of pictures and a tutorial on my Bullseye quilt! It will even be featured on the Timeless Treasures blog. Amazing random! I love reading about your life! The retreat looks brilliant, the chocolate is hilarious and I love Absolut bottles (vodka not so much!). AMH!!!!! wow!! and she's funny too! Levi looks so big!! I can't wait for next week already :) I like the link when people post about random things! Great random. Your life certainly has loads of variety to keep it interesting. Where do you find this stuff?! It is so fun and a wonderful change to read! Thank you for sharing!! Lovely to see your grandson concentrating on the game!!! I love the 'block game'. Sound you have a great retreat together. 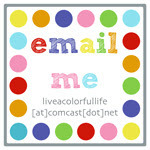 Love to read your blog. It is different and interesting. Thanks for sharing. I can't leave a comment on the 4th link because I don't have a Google + account but her blocks are so creative! 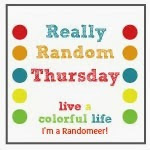 Enjoy your random interesting thoughts! Life is interesting if we take the time to recount the events in it. You do that so well! Thanks ! Lots of fun photos....would also like to know the speed of fast dust. LOL. OMG! I need that chocolate bar, no calories! That's for me. Sincerely, Paula K.
Great random stuff, Cindy! Hope you stocked up on the chocolate bars!! Fun to read about your retreat, and you are sooo right about being off of social media and getting things done! I'm sorry you didn't have anything to hang over the rail, but in thinking about years past, and averaging it all together, you still are pretty productive at this retreat!